A-Kaza was born Terrence Gore in Houston’s notorious South Park neighborhood on March 27, 1983. At a young age, he started rapping chasing the dreams of becoming America’s #1 rapper. A-Kaza was influenced by local rappers such as Lil Flip, Scarface, Lil Keke, etc. Growing up on the streets made it real hard for A-Kaza to focus on becoming a successful Hip Hop artist. A-Kaza joined a gang formally known as MSG, and started gang banging at a very young age. He put his dreams on hold while taking up the role of being a notable gang member in the streets of Houston. 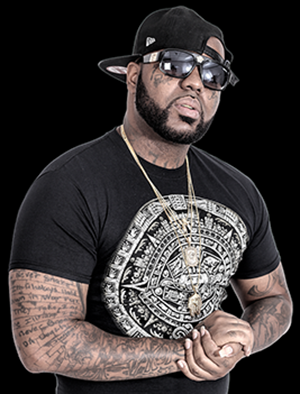 As years past, A-Kaza began to focus on his career as being a successful artist, and was later signed to Houston’s most recognized rap label Rap-A-Lot Records. A-Kaza has worked with notable artist such as Kirko Bangz, Paul Wall, Lil Flip, Killa Kyleon, Scarface, Z-ro, Point Blank, K-Rino, Lil Keke, Just Brittany and many more. He was also featured on Scarface’s mix tape Dopeman Music. He then began recording records full time and gained a lot of recognition in his neighborhood. A-Kaza also started a rap group formally known as Ammunition Gang. He started performing shows in Houston and began to acquire an impressive fan base. He eventually came to receive a distribution deal and had his music uploaded to 16 different online music stores. His first single, Rakkz feat. Just Brittany, Yung Moo, and Lil Flip has become a success, and allowed him to follow suit with another single called No Strings feat Kirko Bangz which is now available on iTunes and 15 other online stores. A-Kaza continues to achieve his goals by performing locally and selling his music online.